With these shimmering studs earrings you attract all attention to your face. In the middle of these earrings there is a blue druzy stone. Do you have 2, 3 or multiple ear holes? 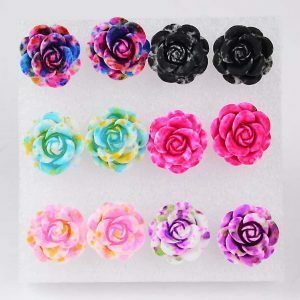 mix and match it with other studs earrings for an ear party! Combine it with other silver jewelry. For example with a nice long necklace or with a stylish ring. 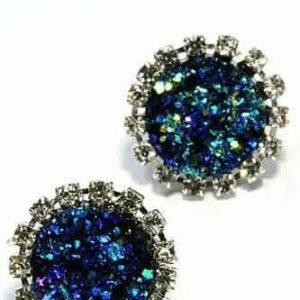 Do you have questions about these stud earrings with blue druzy stone? Send us a message. Yay! 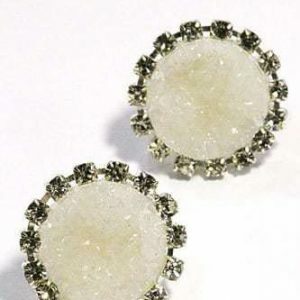 Decorate your ears with the druzy earrings. This pink druzy earrings are full with glittering crystal stones. 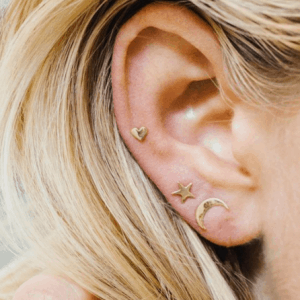 Make your own ear party! Mix and match the druzy earrings with other beautiful earrings. Combine it with silver or gold jewelry. For example with a layered necklace or with a nice bracelet. 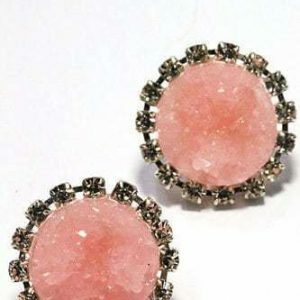 Do you have questions about these pink druzy earrings? Send us a message. 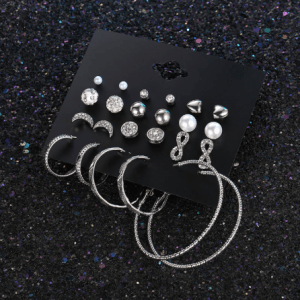 This stylish earrings set consists of 9 stud earrings and 3 hoop earrings. Mix and match these earrings set with other nice earrings for an ear party! Do you have 2.3 or more ear holes? Then wear multiple studs earrings together. Finish your look with silver and gold jewelry. For example with a layered necklace with a stylish bracelet. 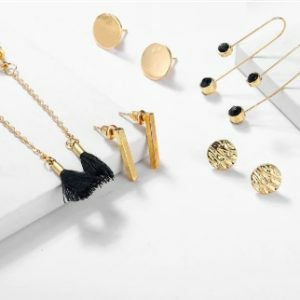 Do you have questions about this stylish earrings set? Send us a message. 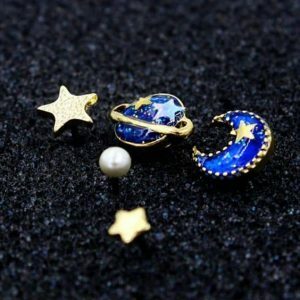 How nice is this earrings set ? 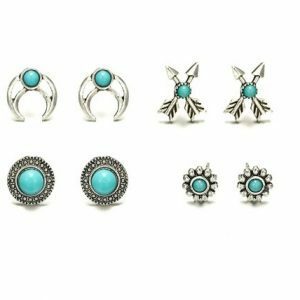 This jewelry set consists of four cute boho style earrings. 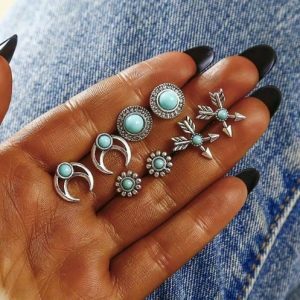 You can wear different earrings with your bohemian outfit every time. 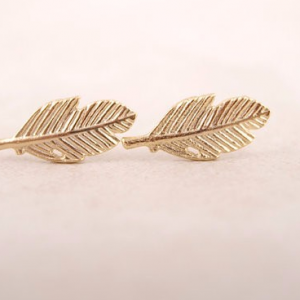 This way you can add new earrings to your outfit every time. Combine the earrings set with other bohemian jewelry. For example with a short chain with arrow hanger. But it will also be nice with a big statement ring with turquoise colored stone. Do you have questions about the boho 4 piece earrings set? Send us a message. 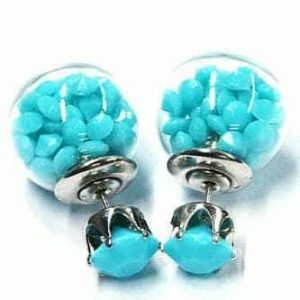 Dubble sided studs, with little blue beads, who look like little jars of yummy candy, perfect for the ones who are still a child at heart. 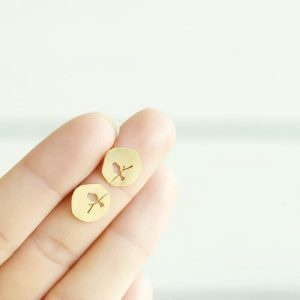 Make your own ear party with these cute stud earrings set. 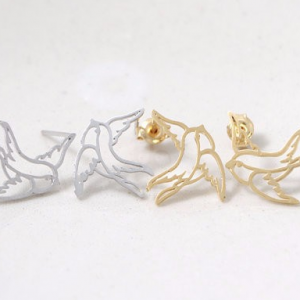 The jewelry set consists of five beautiful stud earrings. 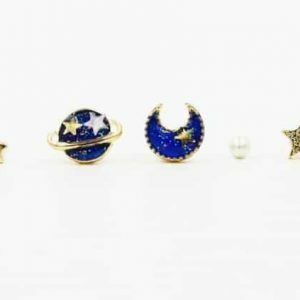 Two star studs earrings, a pearl stud earring, saturn stud earring and a earring with moon design. Combine this jewelry set with other galaxy style jewelry. For example with a minimalistic necklace or with a nice bracelet. Do you have questions about the 5 piece studs earrings set? Send us a message. 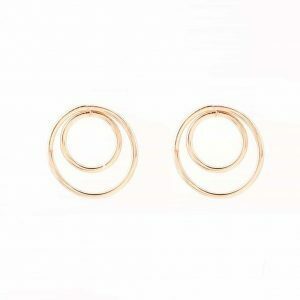 We have a large collection of minimalist stud earrings, which are also trendy. They are characterized by their geometric design. Popular are the circle, triangle, square and bar. 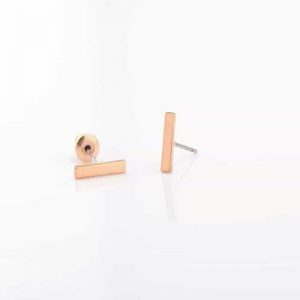 But we also have subtle, fine ear studs for the coffee lover! 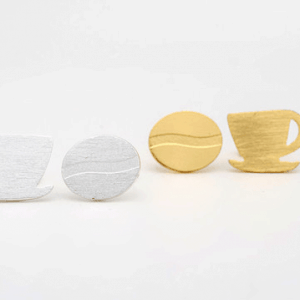 In the shape coffee bean and cup stud earrings. We also thought of the batman fan, and therefore have batman earrings in our collection. Do you love to travel? you’re lucky then! we have cute plane, compass earrings. 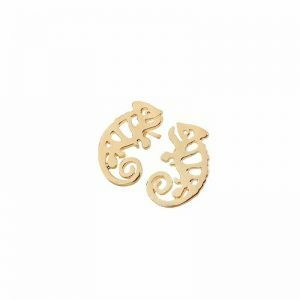 For animal lovers we have nice stud earrings with for example cats, dogs, chameleon, elephant and bee. But also separate earrings with beads belong to our collection. For the summer we have nice earrings with shells and flowers. 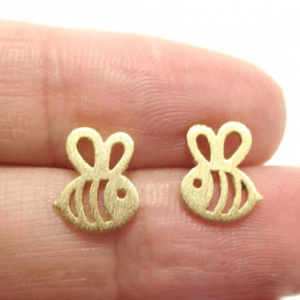 Give a few small but fine stud earrings as a gift to your mother, sister, friend, daughter or just to yourself. 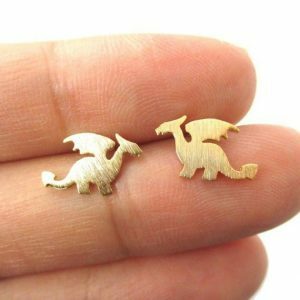 The nice thing about these earrings is that they are easy to combine with your outfit. Mix and match different studs earrings with each other for a real earparty. We have them available in different colors. The classic colors such as, silver, gold and rose gold. But also the colors that brighten up your outfit! Complete your everyday outfit with minimalist, elegant stud earrings. For a summer outfit you can again choose the beautiful colors. 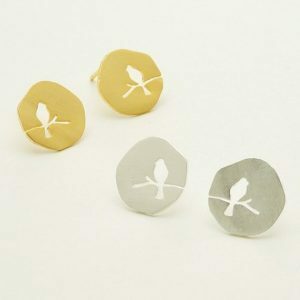 In our collection we also have mini earrings that you can easily combine with your outfit. They have a subtle design, but they still stand out. Combine it with minimalist necklaces, bracelets, chokers or rings. Wear multiple bracelets or multiple necklaces together for an arm party or neck party. 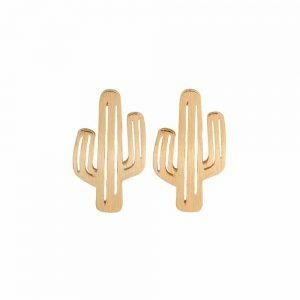 Do you want your earrings to stand out really well? then wear your hair in a bun or tail. All eyes will be focused on you in this way. 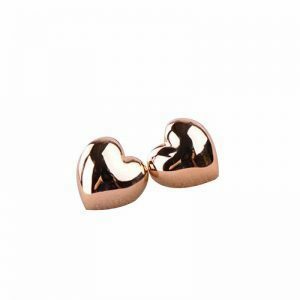 The earrings from Aphrodite are a real finishing touch for your outfit. Be sure to take a look at the rest of our webshop. We have beautiful necklaces in our collection that will fit perfectly with your new stud earrings. We have nice layered necklaces that are available in the colors silver and gold. Combine your gold stud earrings with a gold layered necklace. Your silver layered necklace with silver stud earrings. A minimalist necklace should certainly not be missing in your jewelry collection. The minimalist necklace with heart can be combined with the heart stud earrings. Do you want a cool touch with your outfit? then a velvet choker should not be missing around your neck. The choker necklace is available in the colors silver and gold. You can combine your new stud earrings with your choker necklace. We also have nice bracelets in the category bracelets, which you can match with your new stud earrings. We have beautiful fine bracelets. These minimalist bracelets are available in the colors silver and gold. Combine your new stud earrings with the beautiful rings from Aphrodite. We have large rings with stones. But also minimalist rings. Together with star stud earrings you can wear a trendy star ring. Sign up for our newsletter! 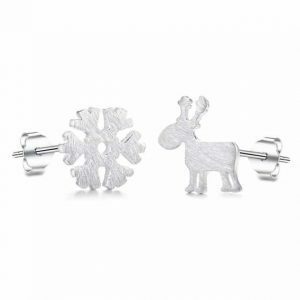 this way you will always be informed when we add new stud earrings to our collection.